When Mike and Maureen Pearlman of Warwick, R.I., visited Wyoming in September 2016, they sought a camping experience without rough edges like rocks in sleeping bags or an absence of hot water. 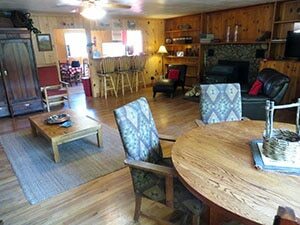 At Glamping on the River in Dubois, the Pearlmans discovered just the right mix of the rustic and comfortable. The couple rented a luxury wall tent complete with a queen-sized bed, a refrigerator and stove, a mosquito net over the bed, and electricity for charging cellphones – all situated near the gurgling waters of the Wind River. “We found Dubois to be like a little bit of heaven,” Maureen said. “We loved it.” In fact, they loved it so much they arranged a return trip in September 2017 for themselves and several family members. 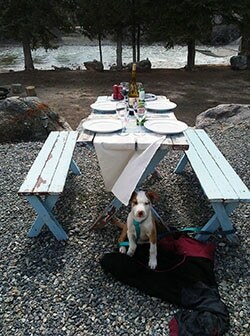 And of course, they planned to stay with Glamping on the River. 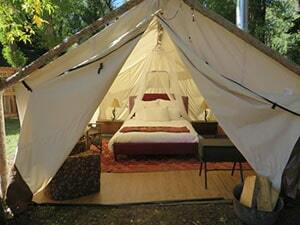 The term “glamping” is a combination of the words “glamorous” and “camping,” Claudia Janiszewski explained. She and her partner, Dave Morris, own and operate Glamping on the River, which consisted of the wall tent rented by the Pearlmans, a 21-foot Airstream trailer, a 1957 retro camper-trailer, and two cabins. The tent and trailers are located pretty much in Claudia’s backyard a mile from the center of Dubois, while the cabins are in the middle of town. All the accommodations sit beside the Wind River. The Airstream sleeps two people in a full-size bed and comes equipped with a gas stove, heater, refrigerator, and cooking utensils. 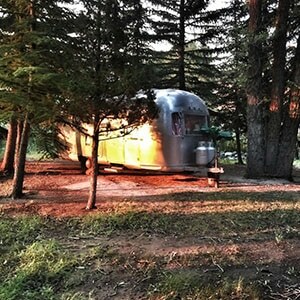 The retro trailer includes similar amenities. The larger of the two cabins can accommodate six people comfortably in two bedrooms, while the small cabin has one bedroom. 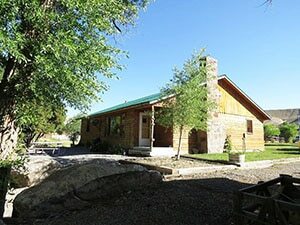 Guests also have access to fishing, bicycles, barbecue grills, and wi-fi connectivity. There is even a hammock for simply relaxing and enjoying the pure mountain air. The tent and trailers do not have individual bathrooms. “You still have a shared bathroom you have to walk 30 feet for — that keeps it in the camping category,” Claudia said with a laugh. Shower facilities also are available. In 2016, while making plans for semi-retirement, Claudia and Dave began considering ways to create an income and still have time and flexibility to pursue other interests. 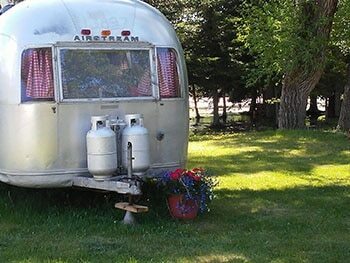 As a result, they listed the Airstream trailer, which had been on the property for years, on Airbnb, an online marketplace where people can rent out their homes and other properties. “We went from just kind of a fluky, let’s try this out on Airbnb to see what happens, and now a year later, we have five lodging accommodations,” Claudia said. They also advertise on the Vacation Rental by Owner (VRBO) website, on Facebook, and on their own glampingdubois.com website. 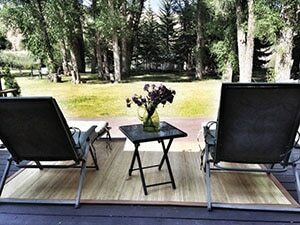 Glamping on the River has received many glowing reviews on Airbnb. 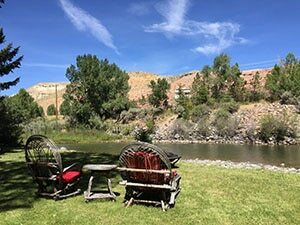 Claudia has started nonprofit organizations, but never a for-profit business such as Glamping on the River that relies so heavily on Internet traffic.  As a result, she turned to the Wyoming Small Business Development Center Network, and Sarah Hamlin, the SBDC’s regional director for Fremont and Teton counties, for assistance. “They were amazing in helping us create our website, and now a lot of our bookings are coming directly through the website, which is really great,” Claudia said.